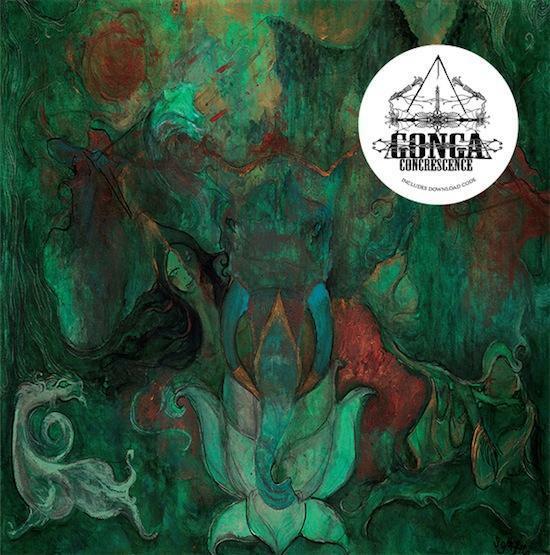 Now here's a welcome surprise – after a protracted, are-they-still-going-or-what type break from the public eye, it's the return of Bristol ur-rock titans Gonga with their third album, Concrescence. And there's another surprise – having lost singer Joe Volk and gone through most of the bassists in the West Country, they're now operating as an instrumental trio. It's an interesting and, on the whole, successful move. While groups making heavy 70s-influenced instro-rock isn't without precedent – Earthlessor Capricorns for instance - it's still quite a bold decision. While there's a plethora of bands out there eschewing vocalists and trading on well-worn post-rock tropes i.e. quiet bit LOUD bit quieter bit LOUDER bit, it's perhaps more of a challenge to fashion memorable songs around riffs and solos without just producing unwieldy jams or dull historical re-enactments. Gonga rise to this challenge by drawing on the melodic nous featured most strongly on their classic eponymous debut album, where they often sounded not unlike a very British version of Queens of the Stone Age – nimble arrangements, heavy execution. They also worship freely before the holy trinity of vintage low-end riffage: the doomy invention of Sabbath, the cosmic rumble of Hawkwind, and the funky heft of Budgie. In addition, the sound on this album is their most organic and all-enveloping yet, and a significant change from the harsher, more angular sonics of second album Transmigration. As such, while never exactly bluesy, Concrescence is an invitingly warm listen, all elements skilfully woven together within the black whorls of its grooves. The album begins with the gigantic slo-mo entrance of 'Miasma', a dense, swirling fog of a song that includes a knowing nod to 'Iron Man' in its lumbering riff. The bass starts to phase, as though overloaded by the dark, glutinous sound, before the track picks up pace, the old Stratofortress struggling to land while rapidly running out of fuel, building to a nail-biting climax. 'Calumet Altar' is almost poppy in comparison, its thundering toms and purposeful riff leading to a gloriously hummable refrain in place of a chorus. It changes gears halfway through to a more threatening riff reminiscent of Electric Wizard's dank heaviosity, though personally, I'd love to have heard more of that refrain. 'Another Day Gone' follows, and it becomes apparent that the songs are getting more technical as the album progresses, moving into the prog metal realm of groups such as Humanfly – on this track, a great spiralling guitar figure peels off in multiple directions, while 'Mount Gonga' features another tricksy twister of a riff which mutates into a juddering blackout of churning bass, like oxygen deprivation during a final ascent. 'Tungsten Gold' is the most up-tempo offering here, similar again in tone to QotSA, though perhaps the one song that could benefit most from a vocal track to give it a bit more shape. But the album closes in style with 'Solar Maximum', the mellow, folky chords of its opening section slowly giving way to trippy toms and a slippery riff that evokes Hawkwind at their grooviest. Rather wonderfully, there's then an echo of the fuzzy ecstasies of the early Cocteau Twins before a final big riff sets the controls for the heart of the sun. This is a fine return from Gonga, its subtleties of texture and tone rewarding repeated listens. And with its release coinciding with new releases from Dead Meadow and the aforementioned Earthless, it might also be helping to usher in a mini renaissance period for stoner rock.